This final chapter pools together all the conclusions drawn in each of the individual chapters to carve the way forward. In addition to the training done for specific locations, a nation-wide poverty eradication drive was launched since 2009. The contents are aligned to the Government of Botswana’s current efforts to eradicate poverty and the UB strategy of intensifying research outputs and impacts. The book begins with part one which provides a conceptual understanding of lifelong learning. Part two focuses on practical aspects and descriptors of poverty and how it requires tackling through a multi-sectoral approach. Part three focuses on poverty reduction in all fronts including development of an entrepreneurship mind-set. This is where the ITMUA and work of Kellogg Foundation becomes very handy through Dr. Chawawa and other regional universities. An overview of the fourteen abstracts suggests a book with an African stance which will demonstrate the wonderful work and portray a positive image of regional Universities and Kellogg particularly in Africa. 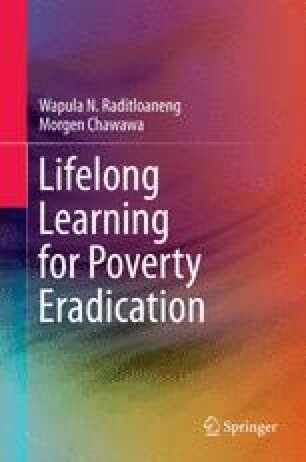 The book illuminates the respect we have and it will be shared with other tertiary institutions to guide the process of community engagement using the work of Kellogg through Dr Chawawa, Prof. Raditloaneng and other researchers in the region as contact points. The UB is impressed with the intension to co-author Ba- Isago as it demonstrates that as the first national university UB has reached out to not only Ba-Isago through the work of Kellogg but serve communities in which universities exist.